This is the stunning sequel to Graphic, in which the horrors of Vince Vanderman’s island of carnage continue with even greater force and horror. When a trio of intrepid truth-seekers ventures to the forbidden island, they find a new twist on all the reported horrors of the past – invisible robotic creatures hunt and kill unsuspecting, innocent victims, and the fight for survival begins all over again. This novel is entirely provocative, engaging and full of thrills and brutal action. Deadly Simulation will have you enthralled and gasping right up to the final gritty twist. These latest mechanical menaces are just as ruthless and brutal as the previous ones, with even more twisted motives behind it all. As a novel with a Christian message included, Deadly Simulation also depicts a simple example of ‘how to know and trust Jesus’, and what that means. By trusting Jesus Christ for forgiveness (accompanied by a genuine desire for change), all of a person's sins are forgiven. While some may think the example in this book to be extreme, and this author purposely does not enter into the subject of natural consequences of our sins (in this novel, at least), the	example is valid nonetheless. God really does want to forgive us, no matter what we’ve done, and He promises to do so when we genuinely ask Jesus for forgiveness, and turn the entirity of our lives over to Him. This is a relationship, therefore, of love between God and ourselves - not servitude or 'turning over a new leaf', or doing our best from here on. One should never underestimate God’s love or His grace, or what He has already done for us, and still wants to do for us. The repentant sinner only need ask Jesus Christ for help (in order to be saved), and all this is amply but simply touched on in this riveting novel. Will any of the intrepid truth-seekers survive the forbidden island? The murderous enemy has developed beyond anyone’s wildest nightmares, and certainly, survival seems impossible... Provocative, engaging and full of thrills and brutal action, Deadly Simulation will have you enthralled and gasping right up to the final twist. Added to this gruesome, mammoth struggle, this story may give you very real reasons to question just how far a government might go to defend itself. Frightening thoughts to consider! And brilliant reading! “Don’t let me drown!” she demanded, willing him to heed her plea. ??? shook and shivered and tried to pull away, but there was nothing she could do to avoid the inevitable. It was cruel and awful, and she whimpered her complaint to the end, but he did what his masters had demanded from the beginning, following his orders without question. The attack seemed to come from nowhere, and it was like nothing the veteran had ever seen. Lola Tuff didn’t know what hit her. They heard its approach long before they saw it. Heavy thudding. Running. And deeply terrifying. “You gonna quit this silly journalism now, and come home with me?” he asked simply. There came a series of crunching thuds as Dina walked her robot to the far end of the room, her machine’s feet crushing shattered concrete as she desperately sought her prey... Dina looked down to the street below, seeking her target, enamored with the anticipation of tearing the young woman apart as a lesson for her friends. Relishing the intense satisfaction of finally taking a stand, ??? took only a moment to stare into the shocked eyes of her victim before easily snapping her neck so horribly that ?? ?’s head then hung lazily against her back as though she was staring at something directly behind her. It was a grotesque sight, and yet strangely satisfying to [her]. “Maybe we finally reached the same place,” he said softly. “More than you know,” she admitted, and she smiled, clearly broaching an entirely different subject. He tilted his head, barely daring to believe, and she didn’t keep him waiting. 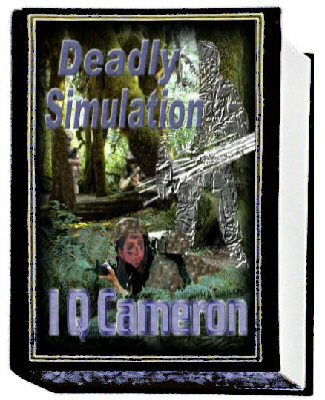 Purchase the riveting conclusion to Deadly Simulation.